Gas Jet Systems delivering controlled flows of low to high densities with typical diameters ranging from few millimeters down to hundreds of microns. These systems are especially adapted to perform in particular the interaction between an IR laser beam and a near-critical gaseous target. The SL-GT-10 system, originally developed at Laboratoire d’Optique Appliquée, is a high-pressure fast-switching gas jet assembly conceived for the interaction between a high-intensity laser and a gaseous target at very high density (above the critical density nc for a near-infrared laser wavelength). 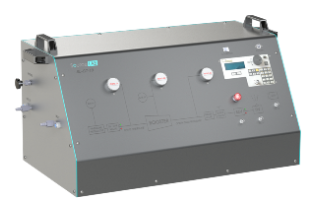 This system can be used for plasma microscopy in the near-critical regime, and high-energy particle or radiation generation, such as coherent XUV pulses, electron or ion beam acceleration.